By entering your details here you agree to receiving our newsletters which will introduce you to our latest creations and offer you exclusive discounts and special offers. Enter your details below to receive our newsletters which will introduce you to our latest creations and offer you exclusive discounts and special offers. Fancy a cuppa? Or rather a mug? 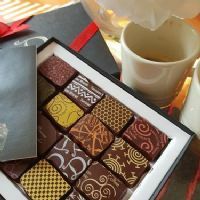 Whatever your preference, our collection of fine tea & coffee chocolates is the perfect excuse for a break and a chat.